Yet another summer of GAA fun awaits young people all over Ireland at the Kellogg’s GAA Cúl Camps following record-breaking numbers in 2018. The attractive and distinctive Kellogg’s GAA Cúl Camp kit that is supplied to participants is worn with pride by young boys and girls all over the country. Another action-packed week of fun and games awaits children aged 6-13 at their local club this Summer, as throughout the months of July and August children of all skill levels can learn and play GAA games with qualified coaches. Registration includes the latest Kellogg’s GAA Cúl Camp jersey, training top and back pack which have become the ‘must have’ kit for kids over the summer! Children are coached in hurling, camogie, football and ladies’ football. One camp in each province will also receive a surprise visit from one of the inter-county player ambassadors. 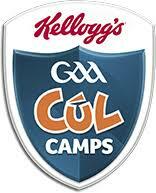 The week-long Kellogg’s GAA Cúl Camps are priced at €60, dropping to €55 for a second child and just €45 for a third and any additional children. All participants get the training top, jersey and backpack. Everyone who registers for a Kellogg’s GAA Cúl Camp can enter a competition for a chance to win €5,000 worth of training gear for their team and a €500 voucher for themselves.